^ "American FactFinder". United States Census Bureau. Retrieved 2014-11-06. ^ "Trends". 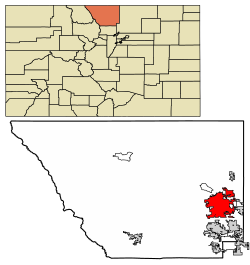 City of Fort Collins. Retrieved 2016-06-21. ^ Grigg, Neil S.; Nolan J. Doesken; David M. Frick; Mike Grimm; 4 Marsha Hilmes; Thomas B. McKee; Kevin A. Oltjenbruns (September–October 1999). "Fort Collins Flood 1997: Comprehensive View of an Extreme Event" (PDF). Journal of Water Resources Planning and Management. American Society of Civil Engineers: 255–262. ISSN 1943-5452. Archived from the original (PDF) on March 15, 2013. Retrieved April 23, 2012. 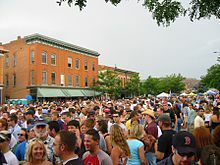 ^ "Fort Collins, Colorado CAFR 2017" (PDF). fcgov.com. Retrieved 27 February 2019. 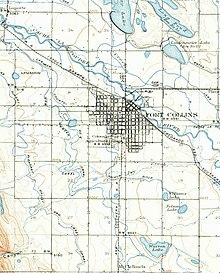 ^ "Street Names Recall Early History: News Flashbacks: Fort Collins History Connection". history.fcgov.com. Retrieved 2019-02-24. 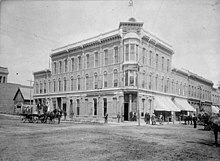 ^ "Fort Collins Municipal Railway - History". 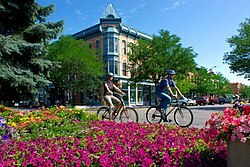 www.fortcollinstrolley.org. Retrieved 2018-11-12. ^ "Best Places For Business and Careers - Forbes". Forbes. Retrieved 18 August 2016. ^ Bloom, Laura Begley. "Ranked: The 25 Happiest Cities In America". Forbes. Retrieved 2017-11-02.